The story behind Dzirga Vertov's Chelovek s kino-apparatom (i.e. The Man with a Camera) is perhaps more interesting than the story itself. 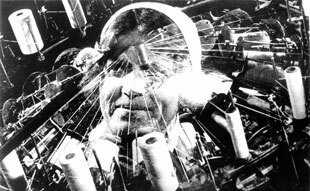 Billed as a day in the life of the Russian people, Vertov spent several years filming, then essentially just retired to an editing bay where he supposedly threw every technique he had at the print, just to see what would happen. What we have is a film without a story or titles that shows the possiblities of the cinematic artform. And while we may not be all that stunned, back in 1929 it was a pretty big deal. For portions of the film, it really just feels like we're watching a kid run around with his new camera, filming everything that catches his eyes, and in a lot of ways we are. The filmmaker that Vertov is filming is looking for images of everyday Russia, which pretty much requires running around and filming everything of interest, but Vertov is able to expand that to include other aspects of the filmmaking process, such as the editor we watch splice together footage and the audience assembled to view the final product. These images of everyday life are often intercut with shots of working machinery. Is Vertov commenting, as some have suggested, on the state of affairs in newly-socialist Russia, or does the juxtaposition just look cool? It's hard to tell, really, in the absence of a plot. When Vertov places the word "experiment" in the opening credits, he really opens up a great deal of speculation to the meaning of his images. He could be trying to tell us something, but he's already said he's playing with the art form, so how much value are we to put into the significance of a scene? The editing is the real draw here. Several of the techniques editor Yelizaveta Svilova pioneered are decades ahead of their time, and most of them still aren't used as effectively as she did on the first try. To say the editing here is influential to visual artists everywhere is a gross misunderstatement. The number of effects is at times staggering. To me at least, it's interesting to watch the people who know they're being filmed, as there's a real childlike giddiness inherent in their actions. Think back to the first time you saw yourself in a home movie and how absolutely cool it felt to be on TV, even if it was just being seen by the people in the living room with you. Now imagine how cool it would have been had you never seen a video camera before and the invention of the technology had been recent enough that no one you know had ever been on camera before. That will give you an idea of just how novel a concept it was for these average people to be in this movie, and try as they might to re-enact their "normal" activities, nothing can hide just how excited they are to even be there. It's not often you see people so happy.